Recently I had a request to conduct a workshop on sewing stroller sacks. 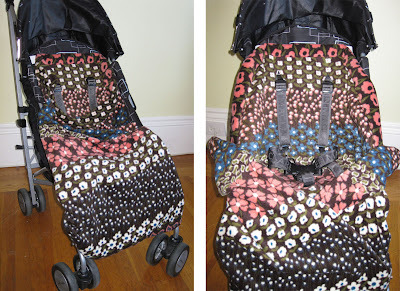 I picked up 1 yard of printed no-pill fleece fabric and grabbed our umbrella stroller. 1 yard was the perfect yardage for our 2-yr-old daughter to fit. Instead of adding zippers on the side seams, I opted to overlap the fabric across the front. It perfectly tucks underneath her body with a closure added. One of the few thing I like about fleece is that the edges won't fray so cutting slits for the straps to come through are very easy & clean. The final result was very stylish, warm, and easy to sew!